Last July, for the first time during a Mass in Italy, a verse of the Koran was recited from the altar. A priest in the south of Italy enraged parishioners by dressing the Virgin Mary in a Muslim burqa for his church’s Christmas Nativity scene. These interfaith initiatives are based on the gradual elimination of the Western-Christian heritage in favor of Islam. The Catholic clergy is probably disoriented by Pope Francis himself; he was the first to allow the reading of Islamic prayers and Koran readings from the Vatican. The Pope embraced religious relativism when it comes with Islam. He repeated that Islamist violence is the work of “a small group of fundamentalists” who, according to him, have nothing to do with Islam. Church of England Bishop Harries suggested that Prince Charles’s coronation service should be opened with a Koran reading. In the US, more than 50 churches, including the Washington National Cathedral, hold Koran readings. Is there any reading of the Christian liturgy in mosques? How is it that so few Christian leaders have raised their voices against this unprecedented attack on a Christian monument? Have they organized so many Koran readings in their own churches so that they now view it as normal to convert a church into a mosque? Would it not be better for the Catholic Church to establish a real dialogue with the Islamic communities based on principles such as reciprocity (if you build mosques in Europe, we build churches in the Middle East), protection of Christian minorities in the Crescent and theological repudiation of jihad against “infidels”? There is a disturbing and growing trend in Italy and Europe. A priest in the south of Italy then enraged parishioners by dressing the Virgin Mary in a Muslim burqa for his church’s Christmas nativity scene. The pastor of the parish of Saints Joachim and Anne in Potenza, Father Franco Corbo, said that he had the special crèche constructed “in the name of dialogue among religions”. These interfaith initiatives are based on the gradual elimination of the Western-Christian heritage in favor of Islam. “A small corner of the cemetery is reserved for Muslim graves. A crib positioned within sight of them could be seen as a lack of respect for followers of other faiths, hurt the sensibilities of Muslims, as well as Indians and even atheists”. In Rebbio, the Italian parish church of St. Martin was preparing the end of Mass. Suddenly a veiled woman, Nour Fayad, took the floor and read the verses of the Koran which announce the birth of Christ. The initiative was intended by the priest, Don Giusto della Valle, as “a gesture of dialogue”. In Rozano, near Milan, headmaster Marco Parma, then scrapped his school’s Christmas carol concert: he decided to ban traditional festivities at Garofani school, “to cause no offence”. 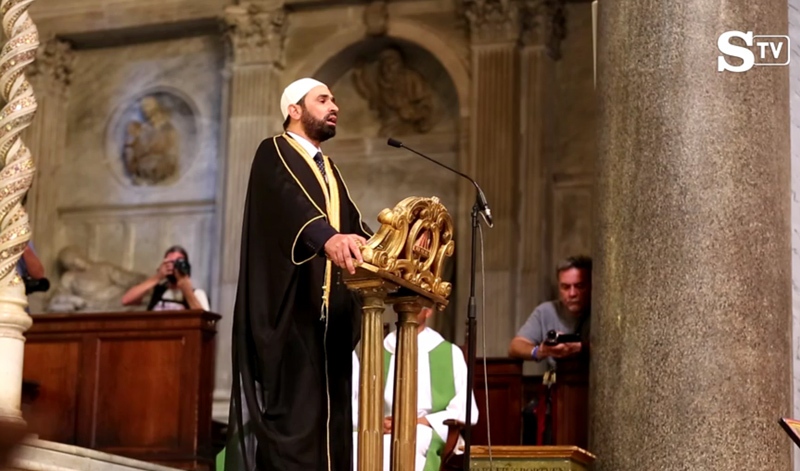 In July, for the first time during a Mass in Italy, a verse of the Koran was recited from the altar. It happened in the Church of Santa Maria in Trastevere in Rome, during a ceremony in memory of Father Jacques Hamel, who was slaughtered by ISIS terrorists in France. While Catholics recited the Creed, a delegate of the mosque of al Azhar Mosque in Cairo softly repeated an “Islamic prayer for peace”. The Catholic clergy is probably disoriented by Pope Francis himself, who was the first to allow the reading of Islamic prayers and Koran readings from the world’s most important Catholic facility. It happened when Pope Francis met with late Israeli President Shimon Peres and Palestinian Authority President Mahmoud Abbas in Vatican City, a gathering designed “to pray for Middle Eastern peace”. Since he was elected Pontiff, Francis has spent a lot of time in mosques. He has visited many Islamic places of worship abroad, as in Turkey and in the Central African Republic, but he was also willing to become the first Pope to visit the Grand Mosque in Rome. When it comes to Islam, the Pope embraces religious relativism. He repeated that Islamist violence is the work of “a small group of fundamentalists” who, according to him, have nothing to do with Islam. When asked why he did not speak of Islamic violence, the Pope replied, “If I speak of Islamic violence, I must speak of Catholic violence”, even though one would be hard-pressed at this time to find any priests, nuns or other Catholics planting bombs anyplace in the name of Jesus Christ. This trend goes beyond Italy. In the UK, Bishop Harries suggested that Prince Charles’s coronation service should open with a reading from the Koran. In the US, more than 50 churches, including the Washington National Cathedral, hold Koran readings. The head of the Protestant Church in Germany, Bishop Heinrich Bedford-Strohm, has also called for Islam to be taught in state schools. Is there any reading of the Christian liturgy in the mosques? These interfaith shows also seem to be making us blind to more disturbing readings of the Koran in Christian churches, such as the one that recently took place in Istanbul’s Hagia Sophia: for the first time in 85 years, Turkish Muslims read an Islamic text inside the Christianity’s most beautiful Eastern church. Their goal, as attested by bills submitted to Turkey’s parliament, is clear: Islamizing the church, which had been used as a museum since 1935. Christian silence is less clear: how is it that so few Christian leaders raised their voice against this unprecedented attack on a Christian monument? Have they organized so many Koran readings in their own churches so that they now view it as normal to convert a church into a mosque? After a terror attack in a church in Normandy last July, the Christian clergy opened the doors of their churches to Muslims. This gesture was welcomed as a turning point in the relation between the two religions. But from a population of six million Muslims in France, only a few hundred Muslims participated. Was their attendance really representative of Islamic public opinion? These well-intended gestures might look like an interfaith gain, but are in fact an ecumenical loss. Would it not be better for the heads of the Catholic Church to establish a real dialogue with the Islamic communities, based on principles such as reciprocity (if you build mosques in Europe, we build churches in the Middle East), protection of Christian minorities in the Crescent and theological repudiation of jihad against “infidels”? To the Catholic clergy who opened the door of Florence’s Cathedral to Islam, Muslims will next suggest removing a painting in the basilica: Domenico di Michelino’s “Dante and the Divine Comedy”. For Muslim extremists, Dante is guilty of “blasphemy”: he included Mohammed in his poetic Hell. The Islamic State does not make a secret of its willingness to strike Dante’s tomb in Italy. Other sites on ISIS’s list include St. Mark’s Basilica in Venice and the Basilica of San Petronio in Bologna, both of which portray scenes from the Divine Comedy. The Italian human rights organization Gherush92, which advises UN bodies on human rights, already asked to have Dante removed from school curricula because supposedly it is “Islamophobic“. In this new interfaith “correctness”, only Islam gains. Christians have everything to lose.